Boutonniere deformity due to incompetence of the digital extensor mechanism at the proximal interphalangeal joint results in a zig zag deformity. Supple cases may respond to splinting. All operations for fixed deformities involve terminal tendon lengthening, which may be combined with central slip reconstruction and/or PIP joint release. Simple terminal tendon release in this context is referred to as a Fowler tenotomy or Fowler's tenotomy. Complete correction with surgery is uncommon. Long term results of Fowler tenotomy alone are not known. Long standing PIP contractures from Dupuytren's disease may result in secondary Boutonniere deformity. Although most commonly treated with open surgery for both conditions, these cases demonstrate percutaneous terminal tendon release for boutonniere at the same setting as percutaneous Dupuytren release. 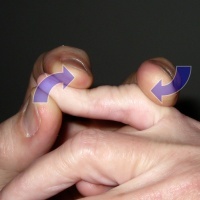 The advantages of this technique are simplicity, and in the case of Dupuytren's, increasing passive PIP joint extension by retensioning the extensor mechanism. The disadvantages are unpredictability of effectiveness and a strong tendency for recurrence. This illustrates the maneuver of an 18 gauge needle: enter from dorsal-lateral, bevel up; advance beneath tendon; rotate bevel 90 degrees to expose cutting edge; withdraw while lightly lifting needle tip to cut the tendon from below. A radial or ulnar approach may be used. The tendon is positioned lax for needle insertion (left), then placed under tension during needle withdrawal to facilitate tenotomy (right). Ideally, the skin is pushed distal from the PIP joint during this maneuver, placing slack in the dorsal nerves and veins to reduce the chance of injury. Left small finger, ulnar approach. Right small finger, ulnar approach. Radial approach for left ring and small (recurrence after prior fasciectomy for small finger Dupuytren's).